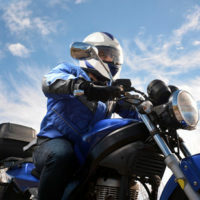 When a motorcyclist is involved in a collision with another vehicle, especially a larger vehicle, the ramifications can be devastating for the person operating the motorcycle. Take, for example, the collision that occurred between a motorcyclist and a Glynn County Police Department squad car. The collision reportedly occurred on Georgia Highway 32 near East Glynn Avenue. Reports indicate that the motorcyclist suffered a broken leg and had a bloody nose, according to The Brunswick News. The exact details of how this collision occurred remain unknown at this time. Nevertheless, it highlights just how serious an accident can be when a motorcyclist and a larger vehicle collide. According to the National Highway Traffic Safety Administration, approximately 4,668 motorcyclists died in collisions with other automobiles. That means nearly 15 percent of all U.S. traffic deaths involve at least one motorcyclist. In Georgia, more than 130 motorcyclists lost their lives in collisions with automobiles. fatalities. Intoxicated Motorist – Despite multiple campaigns to alert motorists to the risks of drunk driving, many people still throw caution to the wind and get behind the wheel of a vehicle after consuming copious amounts of alcohol and other substances. This means motorcyclists, and other motorists, are at risk of being hit and seriously injured by a drunk driver. Driving Over the Speed Limit – If you are traveling above the posted speed limit, you are increasing the chances of suffering a serious injury in a collision. This is because, as the speed and force of impact increases, the chances of enduring a horrific bodily injury increase. Distracted Driving – Texting and driving is a potentially deadly activity. For example, more than 1,500 people lost their lives in auto accidents in Georgia in 2016 as a result of texting and driving, according to the Atlanta Journal Constitution. Nationally, the number are even worse. At least 3,000 people lose their lives each and every year in accidents caused by various forms of distracted driving, including texting and driving. A motorcyclist has little-to-no protection when they are hit by a larger vehicle, whether it be a sedan, SUV, truck, or other vehicle. As a result, motorcyclists are more susceptible to suffering catastrophic bodily injuries. In fact, many motorcyclists involved in collision suffer a traumatic brain injury. If that was not bad enough, severe trauma to a motorcyclist’s brain has been cited as a contributing factor to the motorcyclist eventually losing their life after the accident. If you or a family member was seriously harmed in a motorcycle accident, contact Gillette Law P.A. today. Our legal team is here to help. Contact our office today to schedule a free, confidential case review.